One week ago today was one of my most favorite days of the year! I love Black Friday and typically save up for it in the months leading up. I thought it would be fun to do a little try-on haul for y'all so that you could really see the items I purchased this year. 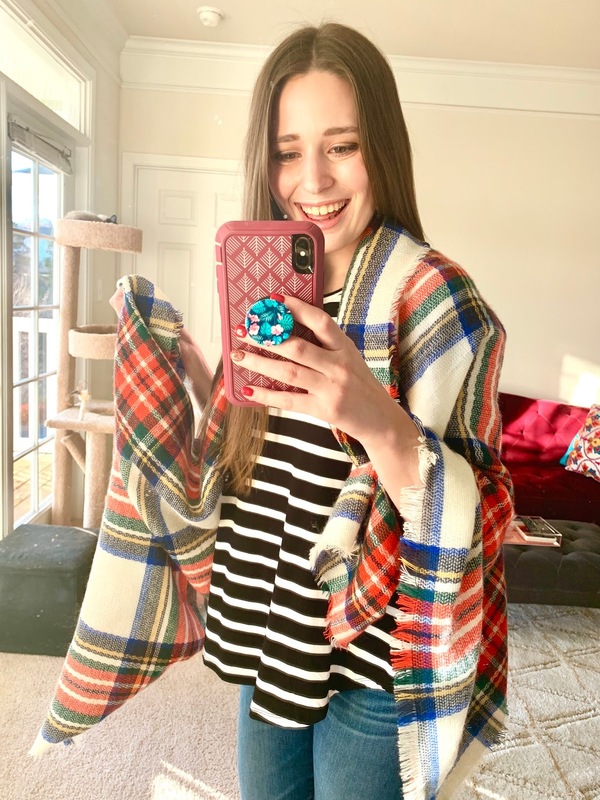 I personally am more of a fan of try-on hauls in blog posts instead of Instagram Stories. (I think they get really long on IG Stories watching them!) Anyways- I wanted to share these items now because a lot of retailers do December sales as well, so there is still time to get anything that interests you. P.S. - you can see Delilah in sleeping in most of these photos! My mom got this cat gym for her while she was visiting, and Delilah LOVES it! 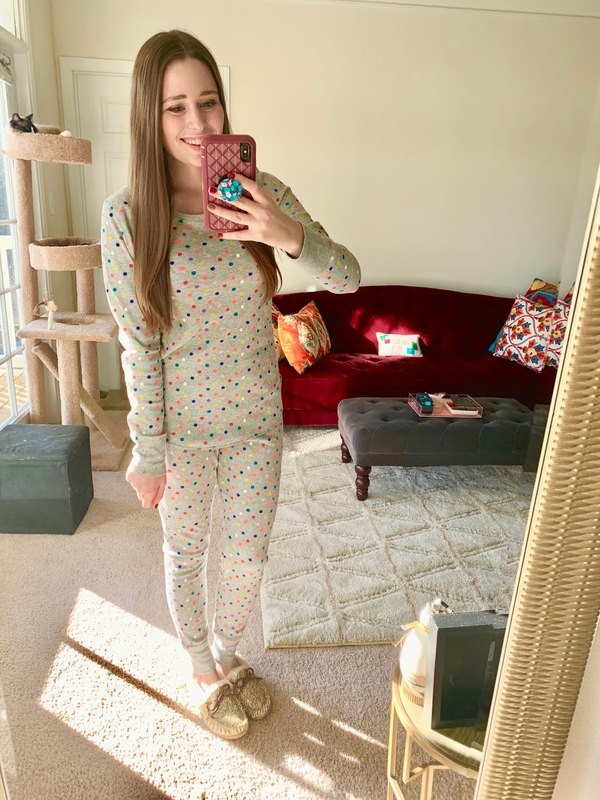 The item that I bought the most this year were... pajamas! My pajama drawer has been a sad state for a long time, think lots of old stretched out shirts with holes in them circa 5-10 years ago. Yuck! It was time to do a serious revamp in that department. I bought three pairs of winter pajamas- I'll probably buy new spring/summer pajamas closer to then. 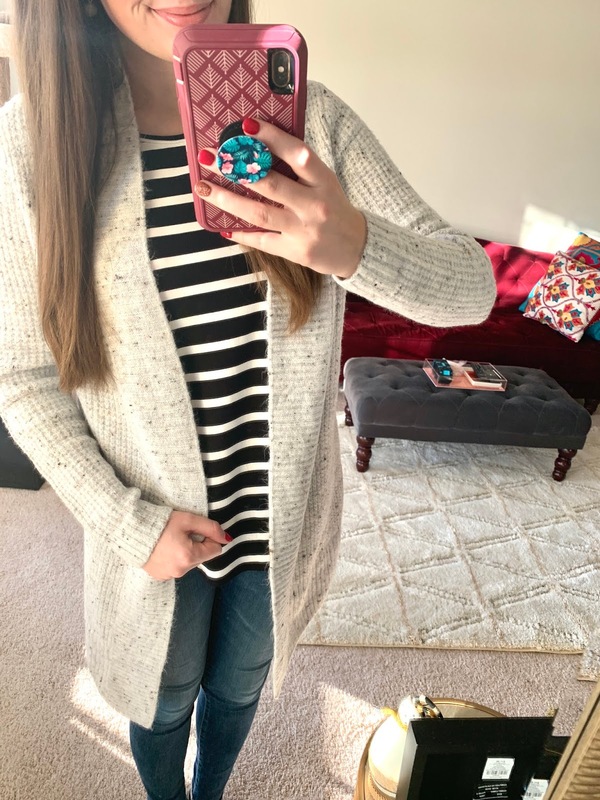 These first ones pictured below are from Old Navy - they had an amazing pre-Black Friday sale that I shopped here in Charlottesville with my mom. To be honest, I've barely shopped at Old Navy in recent years. But I think this season they really stepped up their game with both clothing and pajamas! FYI these run really small! I had to size up to an L in these- the S and M sizes were just too tight on me to be comfortable as pajamas. My friend Ciera and I went to Victoria's Secret on Black Friday in-store, and they had a BOGO sale on pajamas. These are the two I picked up and I love them both so much! 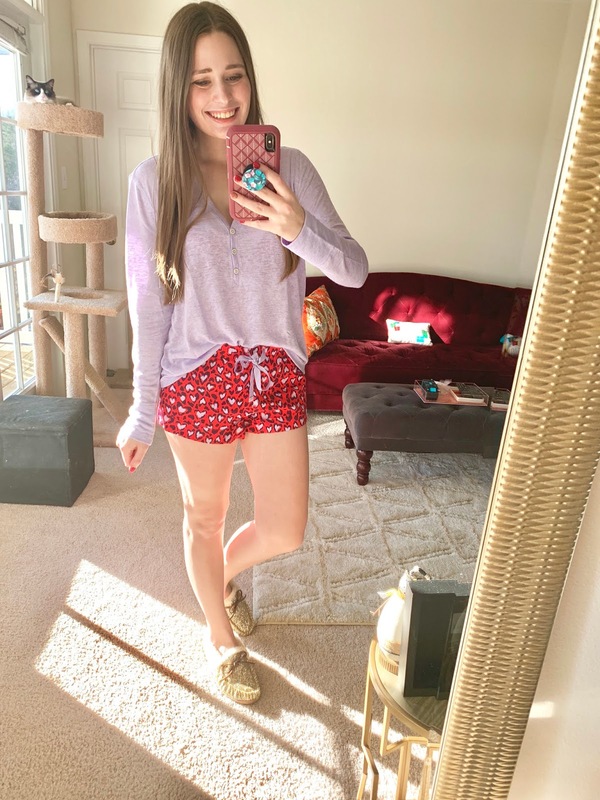 I love the shorts and long sleeve shirt set especially, as I typically sleep in long sleeves and shorts, but I have found those types of pajamas are harder to find as sets. 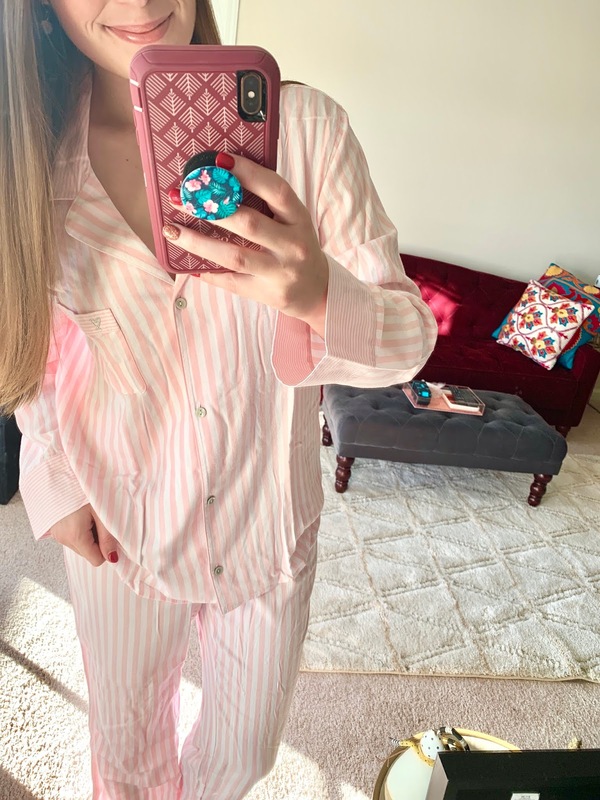 And of course- you can't go wrong with a long pajama set with the classic VS pink stripes! Back to Old Navy! So originally on this Black Friday, I wanted to buy my first pair of Lululemon leggings. 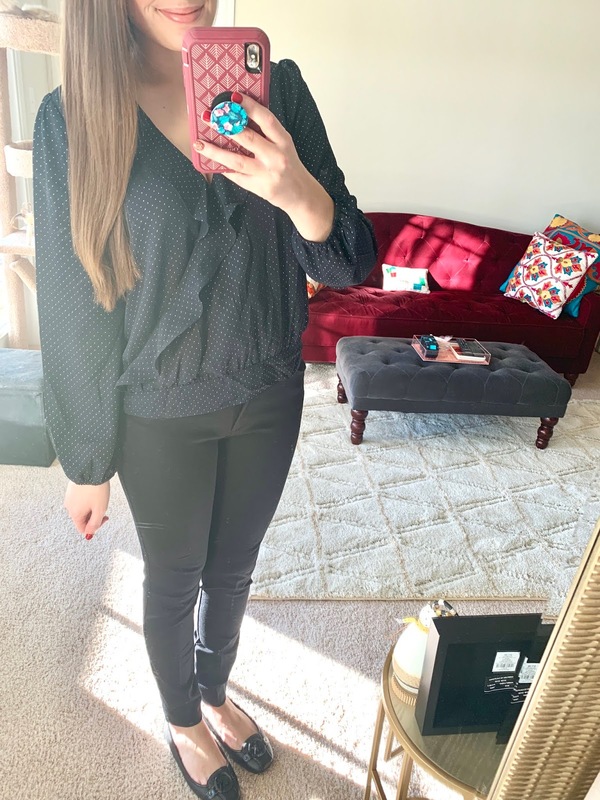 An Instagram follower DMd me and told me that before I invested in a pair of those, I should check out the leggings at Old Navy (she preferred them to Lulu!). I did just that- and found a matching leggings and sports bra set that I loved! The cost of the whole outfit was still probably half the price of Lululemon leggings, so I think that was a win. Time for real clothes! New York and Company is a mall store that historically has had really good Black Friday deals. This year was no exception! They had a lot of $10 door busters, and a big sale on jewelry. 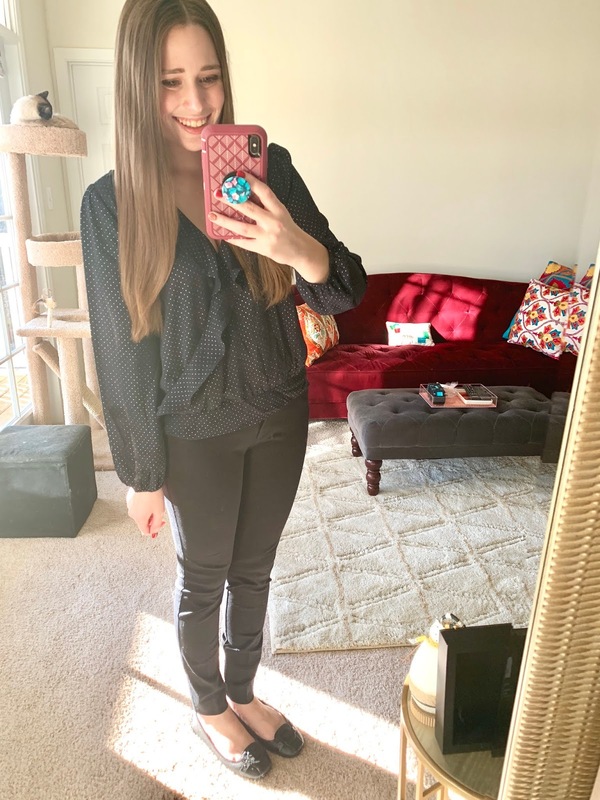 I purchased some new black dress pants (something I really needed), and a cute top for work as well. I'm wearing a size S in the top and size 4 dress pants. The rest of the stuff that I bought on Black Friday in Texas were gifts for friends and family, so now it's back to more of my Pre-Black Friday buys from Old Navy! 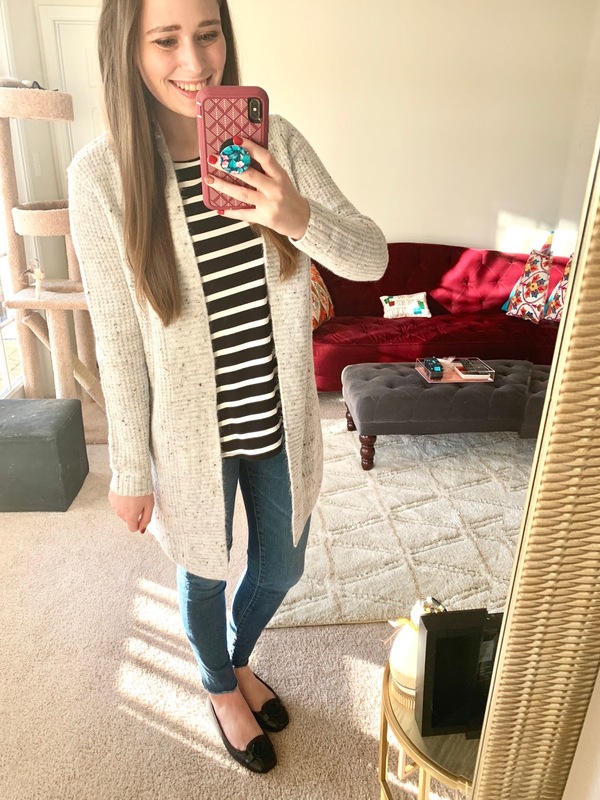 My mom picked out this duster cardigan for me to try-on, and I ended up loving it! So warm and cozy. The item that I was most excited about from Old Navy was this tank top! It gets really hot in the radio studio I work in (my coworkers call it my sauna), so if I wear sweaters to work I often overheat. Ideally I like to dress in layers, and this tank top is perfect for when it gets really hot inside, but is still work appropriate! I also got this blanket scarf! 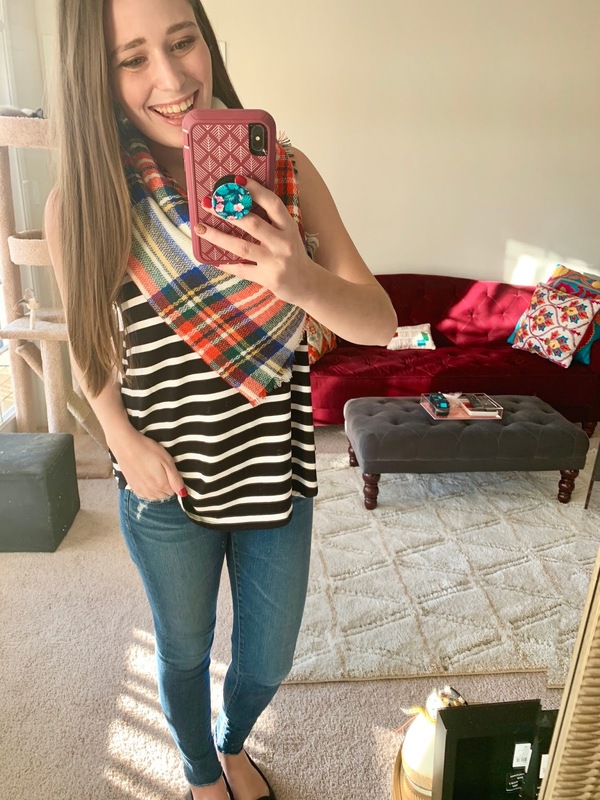 Did I need another blanket scarf? Nope. But I saw Caitlin from Southern Curls and Pearls wearing this (and looking SO cute in it), and then I saw it was under $20 with the sale. SOLD! And lastly, a couple items that I bought online that haven't come in yet. I purchased these diamond and sterling silver earrings, which were an amazing Black Friday doorbuster. They're very dainty and I think they will pair well with statement necklaces. I also purchased this setting powder- I've heard great things about this beauty line and have yet to try it, so I'm hoping this product will be awesome! 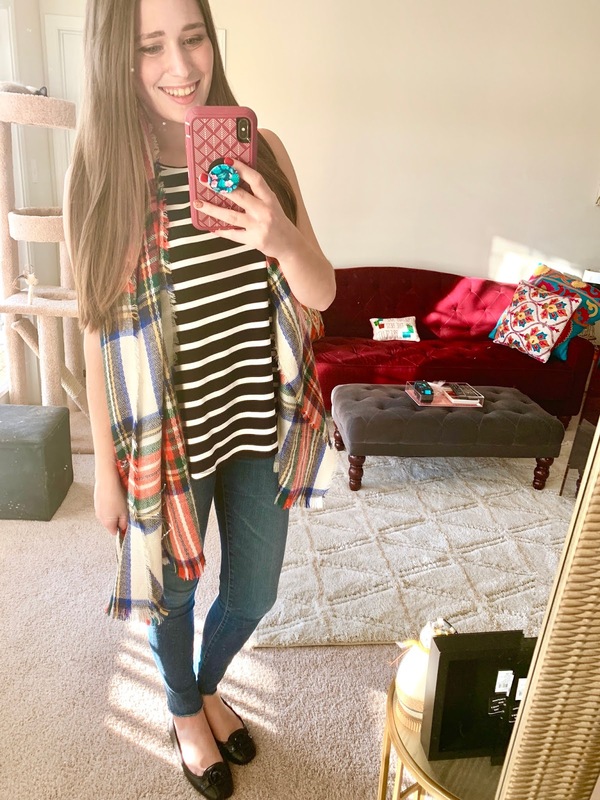 Everything that I bought myself is also linked below for easy shopping! I'm also linking my slippers that I'm wearing in the pajamas pictures. Those are actually from Black Friday last year, but they're still in stock for this season (and so comfy)! Now I'd love to hear- what did you buy for Black Friday / Cyber Monday this year? Is it bad that I think I'm already ready for Black Friday 2019? I love the leggings and matching workout top. So cute. I mostly bought gifts for others that were on sale since I am not sure what I want. 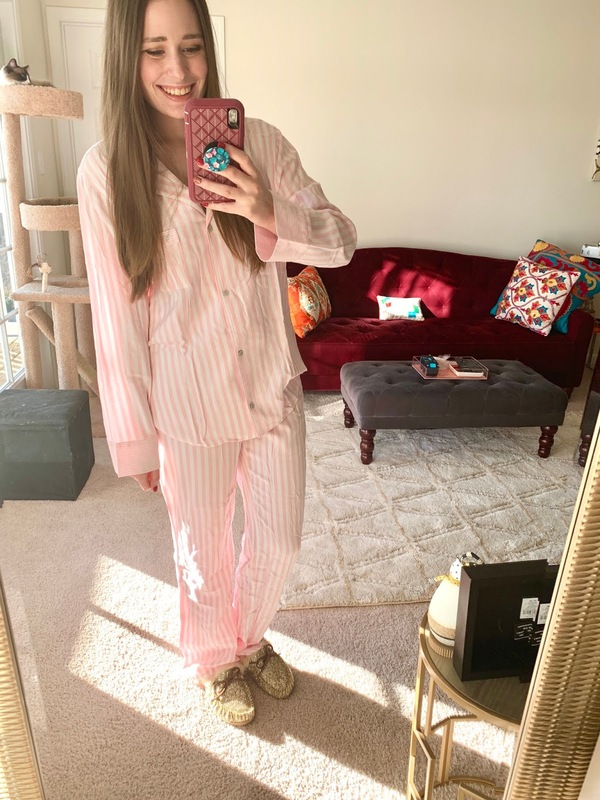 The pink pajamas are so cute! I need something like that! Oh i love everything you got! Those pjs look so comfy! So many cute things! NY&Co actually had a gorgeous $20 cardigan I've been wearing to sleep in - I hadn't shopped there in years! You got such cute stuff! I really need new pajamas, too. Hoping to get a few for Christmas. I love Lululemon leggings. I haven’t tried the Old Navy ones yet. Gonna have to add those to my list. The head-to-toe matching sports wear is a MUST for me! I love feeling put together when I workout. It helps me accomplish more! I can't believe that workout set is from Old Navy! Gotta go check them out! The PJ's are my fave! I a am a sucker even as an adult for a cute set of PJ's. You just reminded me of the sad state of my PJ drawers too! I love your Old Navy polka dot ones! So cute! You got some great pieces! 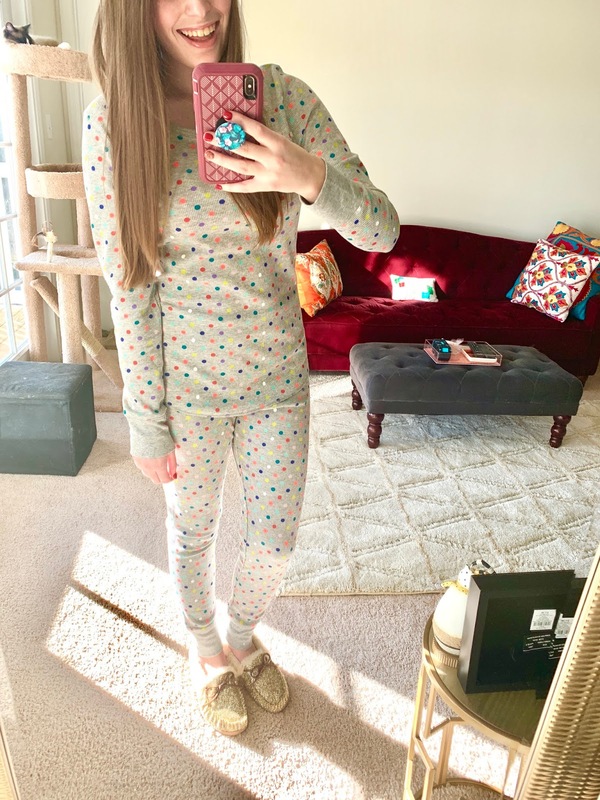 The polka dot PJ's and leopard scarf are my favs! Victoria's Secret pajamas are my favorite! Everything you got is super cute, Black Friday is the best!